I've been getting way behind on my posts about the BBM regular sets but before I move on to the 2003 set I wanted to go back and update some of the earlier posts. 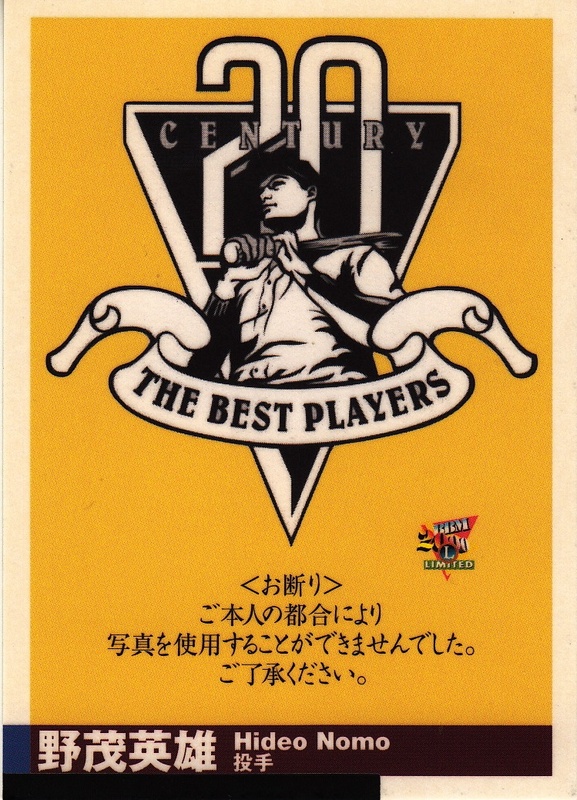 Scott Kaneko was kind enough to send me scans of some of the insert cards that I didn't have examples from and I had picked up a couple example cards from subsets that I didn't have anything from when I did the post originally. I also realized that some of the sheets that BBM included in the boxes actually would fit in my scanner (although most of the posters wouldn't, so I ended up taking pictures of them instead). I ended up updating the posts for the sets from 1994, 1995, 1996, 1997, 1999, 2000, 2001 and 2002 (1st Version) (or almost every post). Thanks for the scans Scott! 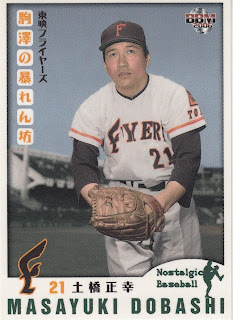 Former Toei Flyer pitcher and Masayuki Dobashi has passed away from ALS at age 77. 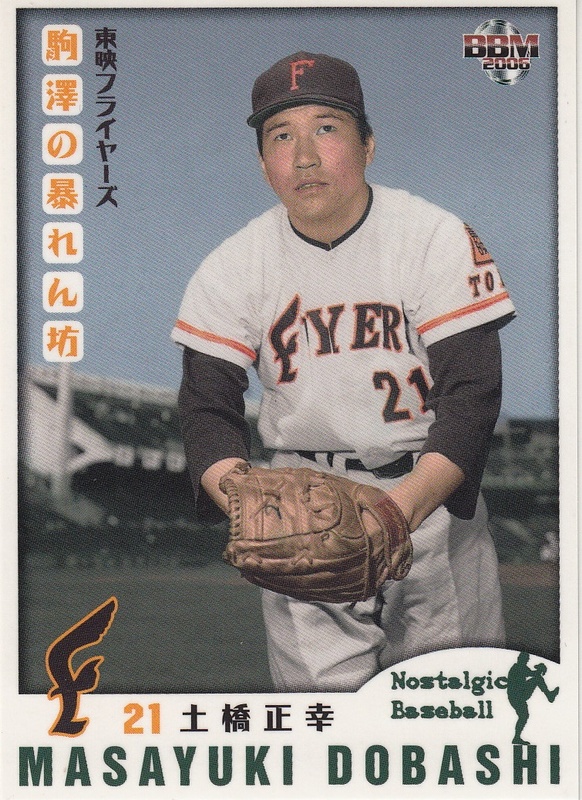 Dobashi pitched 12 seasons with the Flyers from 1956 to 1967. He won 20 games in five different seasons, including a 30 win season in 1961. 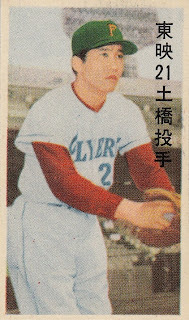 He was MVP of the 1961 Nippon Series, the first of the two that the franchise has won (the other being in 2006 as the Hokkaido Nippon Ham Fighters). After retiring Dobashi had three separate managerial stints in each of the next three decades. He replaced Kenjiro Tamiya as manager of the Nittaku Home Flyers midway through Nittaku's sole season in 1973, but was replaced by Futoshi Nakanishi when Nippon Ham bought the team and renamed it the Fighters for the 1974 season. Ironically his next managerial gig was replacing Nakanishi as Swallows manager in the middle of the 1984 season. He would continue to manage the Swallows to last place finishes the next two seasons. 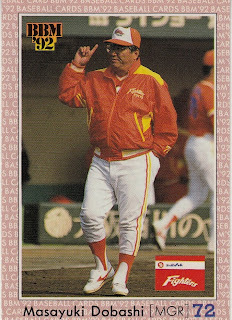 His final managerial job was back with the Fighters for a fifth place finish in 1992. - Ryan has continued to write a bunch of great posts dealing with many of the new card issues in Japan. There are two of particular notice - one is about a team set for the Eagles that is being sold in packs at their ballpark and possibly nationwide. It's called Heat (which is part of the Eagles's team slogan for the year) and resembles a BBM team set in a lot of ways. 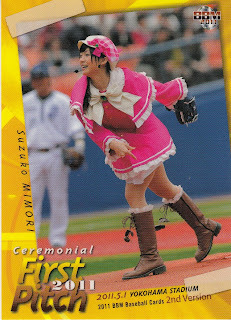 The other post is on baseball cards being given away at games between teams in the Japanese Women's Baseball League. Apparently the cards are being given away one at a time when you enter the ballpark for the game. This is one of the very rare times where BBM used a posed, studio shot rather than a candid or action shot from the field. There were a couple cards like this in the 2011 set - I've wondered if BBM was forced to use these shots because of the earthquake that March. It was interesting how this weekend's series between the Eagles and Marines went. The Eagles had lost several games in a row and the Marines were on a tear, having cut Rakuten's lead to only 2.5 games. But the Eagles swept the series and Lotte leaves Sendai 5.5 games back with only six weeks left in the schedule. 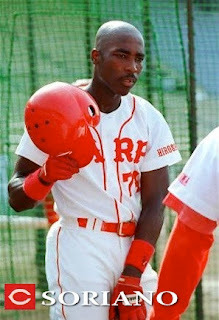 A couple weeks back, Alfonso Soriano of the Yankees got his 2000th career hit, making him eligible for the Meikyukai. If you are surprised by this, you're not alone - Soriano himself was not aware that he was eligible or even what the Meikyukai was. If you're confused by this, you might not be aware that like former Met Timo Perez, Soriano was originally signed out of the Dominican Republic by the Hiroshima Toyo Carp. He appeared in 9 games for the Carp in 1997 and got two hits. 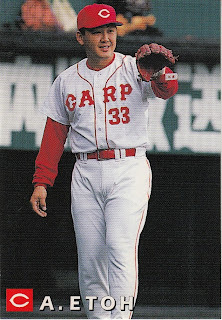 By the current rules of the Meikyukai, he is eligible for membership (and Andruw Jones is not) because he got his first hits in Japan. I don't know if the Meikyukai has made an announcement or not about when or if they will be awarding Soriano his jacket. As I said, former Met Timo Perez was also originally signed out of the Dominican by the Carp. Perez actually had two Japanese baseball cards from the 1996 and 1998 BBM Diamond Heroes sets. 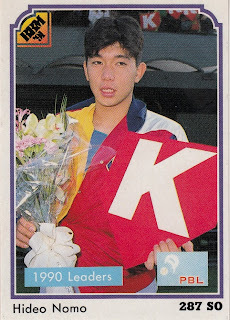 Soriano, on the other hand, has never had a Japanese card. I didn't quite get the font right and considering that there was really only two things I needed to add to the picture, that's pretty bad. But I don't think it's that bad for a first try. If anyone wants to give me some pointers on how they create CTNW on their blogs, I'm all ears. 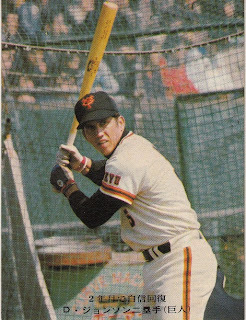 I'd love to try to create some cards using old Topps designs. 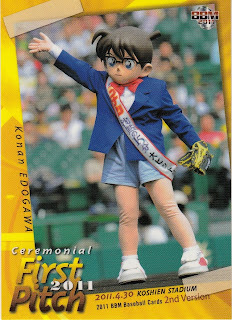 It has occurred to me that I really have never talked much about Hideo Nomo's cards on the blog so I thought I would take advantage of the fact that the Dodgers held a "Hideo Nomo" night last Saturday (he threw out the first pitch and they gave away bobbleheads) to do so. 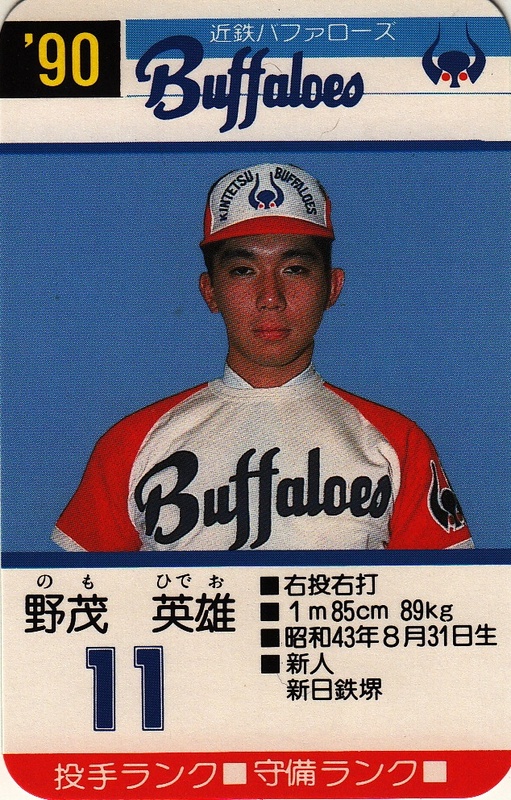 Nomo actually only played for five seasons in NPB, all with the Kintetsu Buffaloes from 1990 to 1994. His first four seasons were outstanding - he lead the Pacific League in wins and strikeouts each of those years and won both the MVP and Rookie Of The Year in 1990. 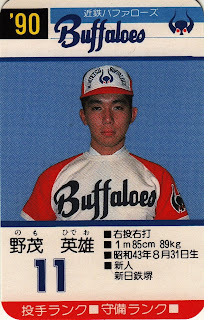 In 1994, however, the Buffaloes changed managers, dismissing Akira Ohgi (who would go to Orix and let a certain 20 year old outfielder hit the way he should) and bringing in Keishi Suzuki, who did not see eye-to-eye with Nomo on how he should be used. 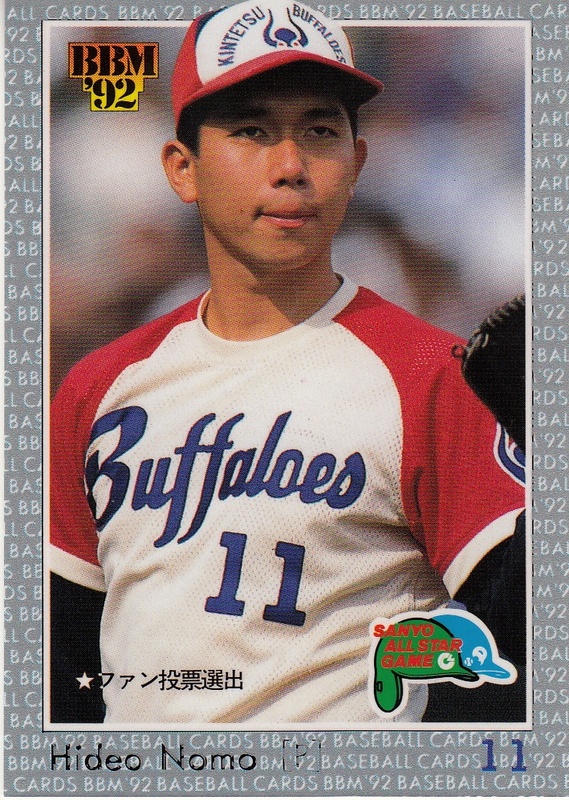 Following the 1994 season, Nomo took advantage of a loop hole in the rules that allowed him to "retire" from NPB, become an international free agent and sign with the Dodgers. That Takara card is the only card of Nomo from 1990, his rookie season. It could be argued that this is his only real rookie card. I don't know the reason why Nomo has not appeared in any Japanese sets in the last 19 years. 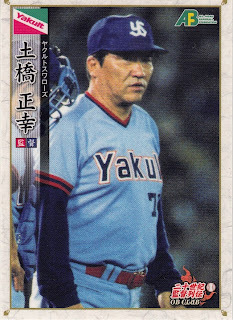 I don't know if Nomo doesn't want anything to do with Japanese baseball or if the card companies (or NPB) are still carrying a grudge over the way Nomo departed from Japan. It would actually be nice to see him show up in an OB set some time. I've been remiss about reporting on this but there's actually a TV channel that is carrying Japanese baseball games with English play by play. It's One World Sports and they have been the sponsors of John Gibson's Japan Baseball Weekly podcast this year. John is also writing a blog about the Giants and Japanese baseball on their website. OWS started out this season just carrying Giants home games. Typically they will carry the game live early in the morning and run a replay of it later in the day. They have recently started carrying some Pacific League games as well. The problem with OWS is that it is not carried by very many providers. There's only four and I think only one of them (Dish Network) is nationwide. However, at some point recently, they started offering a streaming feed on the internet. There's something that says you need to register for a preview of the channel for a trial period but I've been able to watch without registering. I did have to download a plugin to get the streaming to work. The video player does not "pop out" of the browser (like the Justin.tv feeds do) and it does not work on mobile devices. 8/19 UPDATE - I don't know if something changed since last week or if I just missed something but it turns out that you can stream on a mobile device - I was able to do it today on my iPad using both Chrome and Safari. It looks like what they are doing is taking the video feed (with game audio) from one of the Japanese networks and adding the English play by play. I've only watched today's Giants/Baystars game so I don't know if every game is like this or not (although I do get some sense that it is from their YouTube channel). I assume the broadcaster is in the ballpark but I don't know that for sure. It strikes me that the broadcaster doesn't know the players particularly well (he called Nori Nakamura "Nakamoto") but I may have just caught him on a bad day. 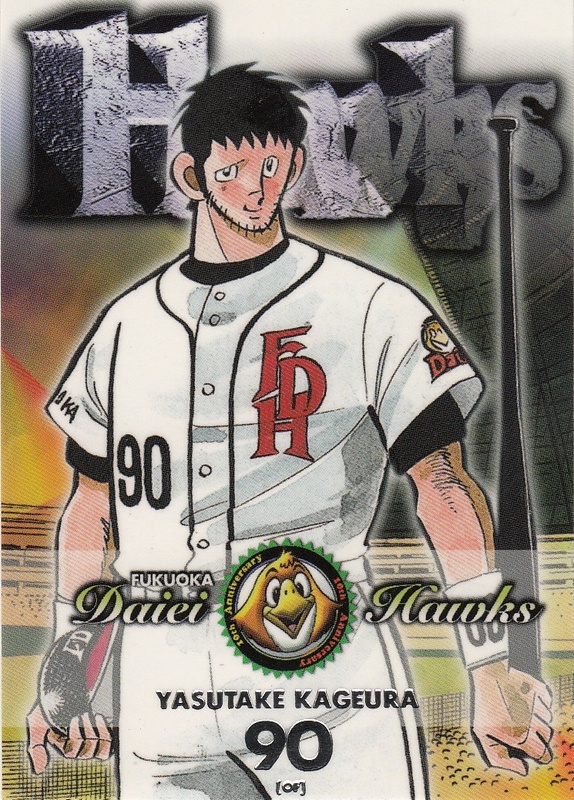 He did keep referring to the team in Sapporo as "the Ham Fighters" as in "the Ham Fighters of Nippon" rather than "the Fighters of Nippon Ham" which is a pet peeve of mine. Still something is better than nothing. I've been told by friends and neighbors that there are English language broadcasts of Japanese games that have been showing up on Comcast sports channels in Maryland (I have Direct TV and have no access to these channels). I have wondered if those broadcasts have been syndicated from OWS. What I'd really like to see is OWS set up a mobile app to allow streaming and sell subscriptions. For me personally that would be much more convenient than the current set up. Otakon is taking place this week in Baltimore. Otakon is a convention that celebrate Japanese pop culture, especially anime and manga. My youngest daughter is a big fan of many different mangas and animes and attended the convention with a friend and my wife the last two days. Funny thing happened this morning - my wife had a schedule conflict this morning and I had to deliver my daughter and her friend to the convention and pretty much hang around until my wife could meet up with them. My daughter gave me strict instructions not to wear any Japanese baseball stuff - no jerseys, no t-shirts. She was OK with me wearing my Dragons hat because she figured no one would really notice it. So of course, as soon as we got in line to get into the convention this morning, the guy in front of us turns around, looks at my hat and says "Hey, another Dragons fan". 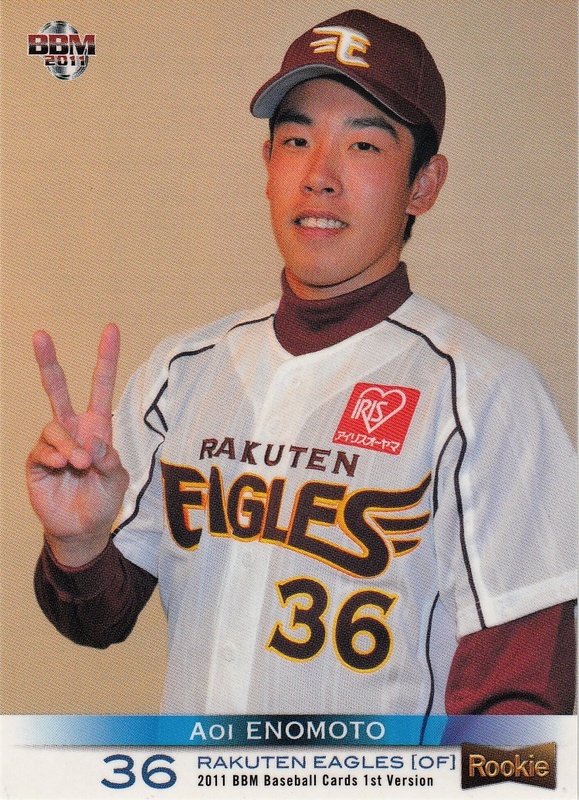 Turns out that he used to live near Nagoya and was a big Dragons fan. 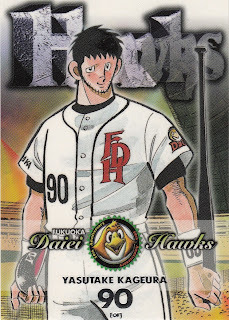 We spent the next ten minutes or so talking about how much we preferred Ochiai over Takagi as manager and how the entire Dragons lineup was freaking old. My poor daughter, she can't take me anywhere. Ryan over at This Card Is Cool had two really great posts lately that I wanted to draw attention to (Ryan actually always has great posts but these two are of particular interest). 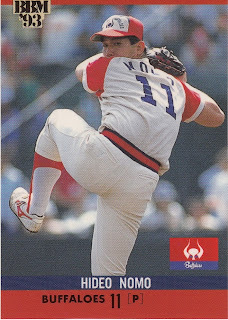 One of them is on the latest Epoch/OB Club set dedicated to Rookie Of The Year winners and shows all 40 of the cards (including players from the Yakult Atoms and Nittaku Home Flyers!). 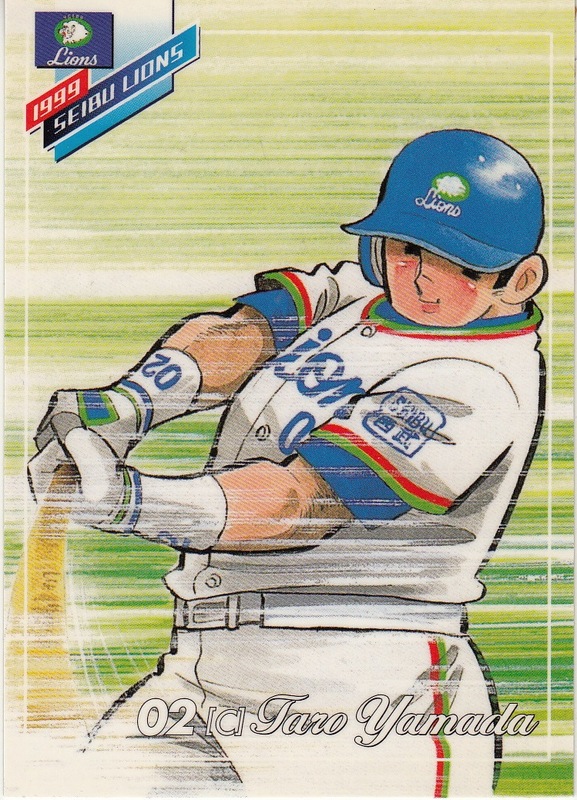 The other is a discussion on what's out there in the way of checklists for Japanese baseball cards and what kind of checklists exist in Japan. 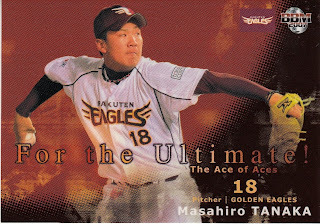 The Tohoku Rakuten Golden Eagles are on a tear right now. They've won seven straight and have opened up a seven game lead over the Lions and Marines. Part of the reason they're playing so well is that their ace pitcher, Masahiro Tanaka, has been on a tear as well. Tanaka has won his first 15 decisions this year which is tied for the record for most wins to start a season. He's also won his last 19 decisions going back to last year which is one short of the record for consecutive wins. Not sure when his next start will be this week (Friday maybe?) but I'll try to get up early enough to catch some of it. - Two new box sets called Young Lions and Young Fighters featuring young players from the Lions and Fighters respectively (not that you really needed me to explain that...). Each set contains 28 cards - 27 cards for the base set and 1 "special" card that could be any number of different types including memorabilia or autograph. You can figure that Yusei Kikuchi and Shohei Ohtani will be prominent in both sets. I assume that there is more than one card for each player in the set but the web sites don't break down the sets in any more detail. They will both be out in late August. 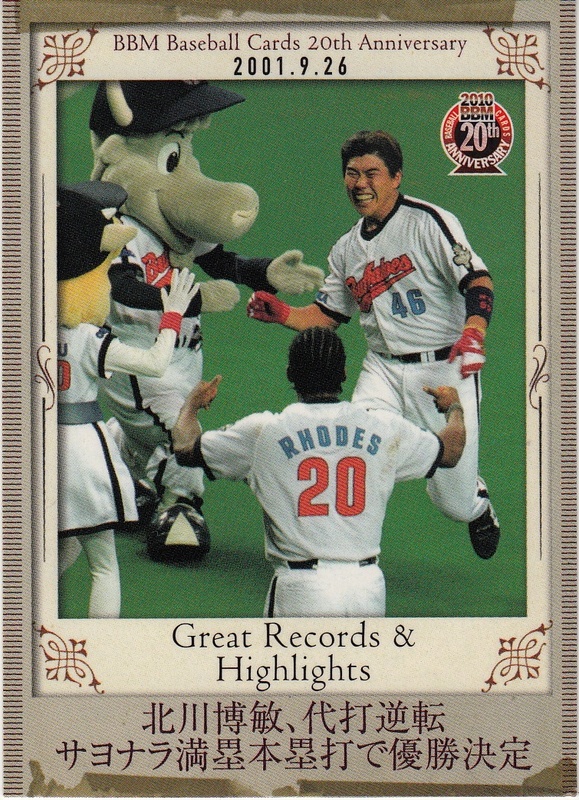 - On September 26, 2001, the Osaka Kintetsu Buffaloes trailed the Orix Blue Wave by a score of 5-2 going into the bottom of the ninth. The Buffaloes loaded the bases and won the game on a grand slam by pinch hitter Hirotoshi Kitagawa. 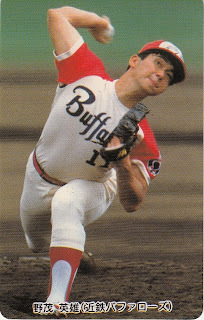 That win clinched the Pacific League pennant for the Buffaloes, their first since 1989 and only their fourth ever (this was of course prior to the Pacific League starting a playoff system). And no one knew it at the time but it would be Kintetsu's last pennant since they merged with Orix following the 2004 season. BBM is issuing the third of their "Greatest Games" box sets to commemorate this game. I don't know too much about the set - not even the number of cards - but it will be released at the end of August. - A month or so ago, BBM released a set of cards celebrating players from the island of Kyushu. 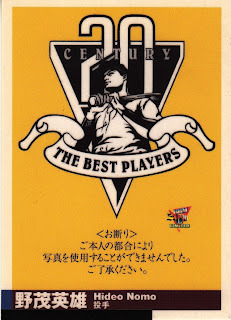 They are following that up by doing a set of cards for players from Osaka. This is a pack based set featuring either 90 or 99 cards in the base set. I think there's 69 cards for active players, 3 cards for high school classmates and 18 cards for "Legends" (OB players I assume). That only adds to 90 but I think something else on the page says there's 99 cards so I'm not sure. There will also be an insert set and various autograph cards available. The set will be out in late August. - This year's high end set is again called "Genesis". This will be a pack based set with 156 cards in the base set - 108 "regular" player cards (9 per team including 1 rookie per team), 12 team checklist cards and 36 cards for the final part of the "Cross Wind" cross set subset (3 per team). Also available are several different insert sets (including a 3D one and a plastic one I think) and a batch of autograph and memorabilia cards. There's also some ridiculous variety of parallel versions of the cards - both in the base set and the insert cards. The set will be out in mid September (as opposed to the other five sets I've mentioned here). I have seen nothing about an All Star set this year - if BBM does not do it, it will be the first time since...well, ever, at least since BBM started doing cards (in 1991).